The layout involves a large scrolling banner of the company’s works with text strategically placed below to create a nice clean easy to navigate site. The website was designed to be easy on the eyes with the use of a black-and-red color scheme. Menu options can also be easily accessed above the webpage with links to their company profile, contact details, list of services, and portfolio information. 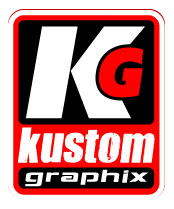 Kustom Graphix overhauled their website to show their willingness to keep up with the times, as reflected in their mission to embrace technology. They have been a prominent provider of trendy signs and banners in Perth since 2003, and have since expanded their expertise to logo design and graphics development. They can handle any large format printing project for any business at generous prices, and they are looking forward to reaching even more clients with the launch of their new website.